One of Sydenham’s oldest established and most popular restaurants, Golden City is noted for the consistently high quality of the food and the service. The menu features Peking and Cantonese cuisine with a very special emphasis on vegetarian dishes. This busy restaurant, right in the heart of Sydenham, has a loyal clientele who appreciate the spacious and comfortable environment, the friendly and efficient service and above all the finest of Chinese cuisine. Open Mon-Sat noon-2pm and 5.30-11.30pm. Closed Sundays. All major credit cards accepted. No service charge. 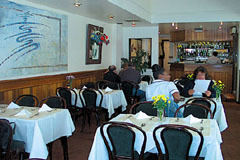 The menu features a range of Peking and Cantonese dishes.